The Ducks and Sun Devils are coming off much needed byes. Not necessarily because of injuries, although it is good that Vernon Adams got a week of rest, but because of their need to step back and regroup. With Adams’ return last week, the Ducks offense looked much more explosive and reliable, so hopefully the team realizes this and rallies around this finding. 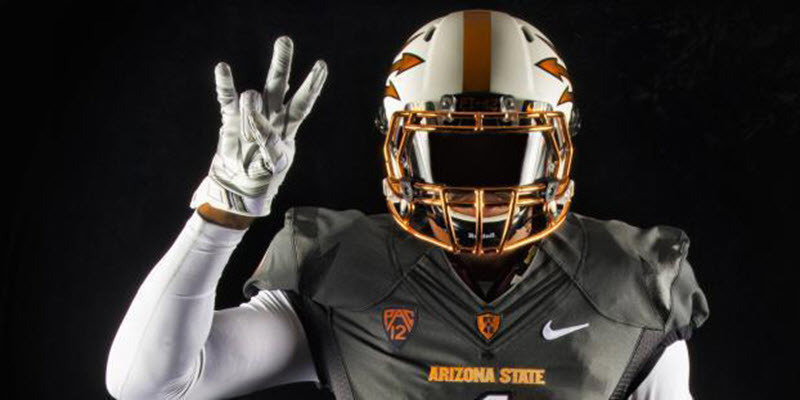 Arizona State is a very talented team with many playmakers. They are also a hard team to gauge. They have three losses, but those losses are to three very good teams, Texas A&M, USC, and Utah. They should have a very explosive offense with all their playmakers, yet they don’t. With all the defensive players they lost, they should have a middling defense, yet they don’t. It seems as though the Sun Devils can be the best team in the Pac-12 South, or they can be one of the worst. Let’s take a look at some of these explosive playmakers on offense. 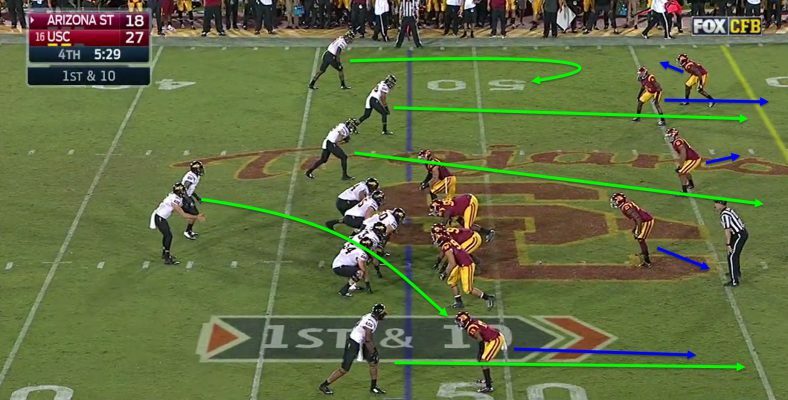 To start, we are going to look at the Sun Devils’ run game. ASU has three potent runners, running back Demario Richard, half back (think Byron Marshall/DeAnthony Thomas) D.J. Foster, and quarterback Mike Bercovici. Richard is a huge running back, standing at 5-foot-10 and 220 pounds. He can run you over or put you on skates in the open field. As a side note, for those of you who like college football trivia: in FBS 1-A, who reached 2500 receiving and rushing yards? Answer: Nobody. This may change after this year though; Foster is 235 rushing yards and 348 receiving yards short. There’s a lot going on, but the two guards and the tight end will be setting the edge for Richard. As you can see in the screenshot above, the Sun Devils are lined up in trips. The Aggies are lined up in a 4-3 across from them. Pre-snap, the receiver wide left is going to go in motion to pose the threat of the fly sweep, ending in a 2×2 set or doubles. This also gets the defense moving to their left, away from where the play is going to go. Pay attention to Foster, the receiver shown blocking. At the snap, the two guards are going to pull along with the tight end to seal the edge for Richard. The right tackle and center are blocking the people lined up in front of them, while the left tackle is going to block the left defensive end into the left defensive tackle if possible. The possibility for a sweep freezes the defense temporarily, enough to allow the three pulling Sun Devils to get outside. Foster gets a second block in allowing the three other blockers to account for every defender. The other receiver who is wide left is Foster, the most potent Sun Devil. He isn’t just the most potent Devil with the ball, though; he can also block. On this play, Foster throws his man aside and then moves his way downfield to the second level, blocking a linebacker. This leaves three A&M players to be blocked by three Sun Devils, and by my math, that’s a big play. Richard has a huge lane and goes for a big gain of 19 yards. 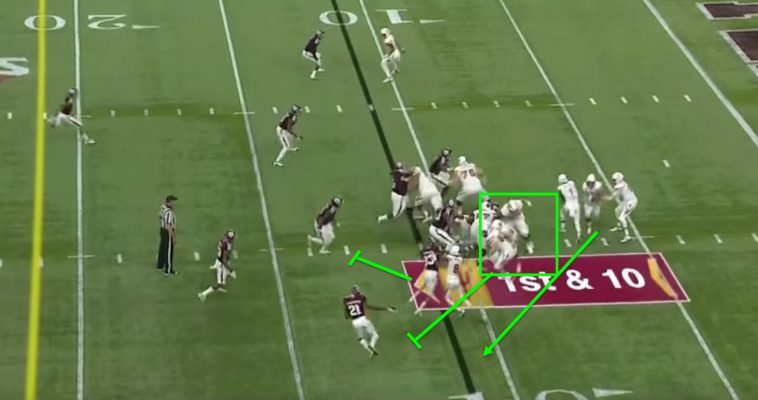 This play still would have been successful if Foster had only blocked one player because the first Aggie player wouldn’t have been able to get to Richard until he had gotten at least six yards downfield. Bercovici is a very capable quarterback, as he proved last year coming in for injured Taylor Kelly and winning games. The Sun Devils are a pass first team, but they prefer to “dink and dunk,” as shown by their average of 6.7 yards per attempt. That is, until you start cheating. Then they will unload the deep ball. Their short passes are nothing you guys haven’t seen before, so I’m going to show you the deep ball. 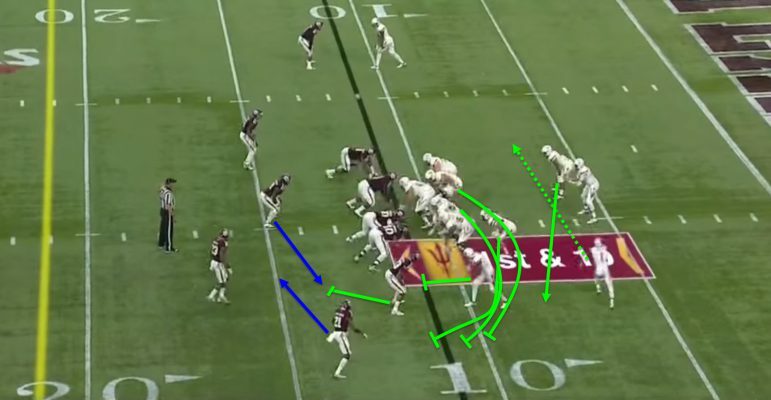 As you see in the screenshot above, the Sun Devils are lined up in trips left with another receiver wide right, and Bercovici and the running back in the gun. The Trojans are lined up in 3-3-5 across from them. The Sun Devils love running deep zone beating routes. At the snap, the receiver lines up to the far left and runs a short 3-5 yard curl route, which is almost surely going to be open. 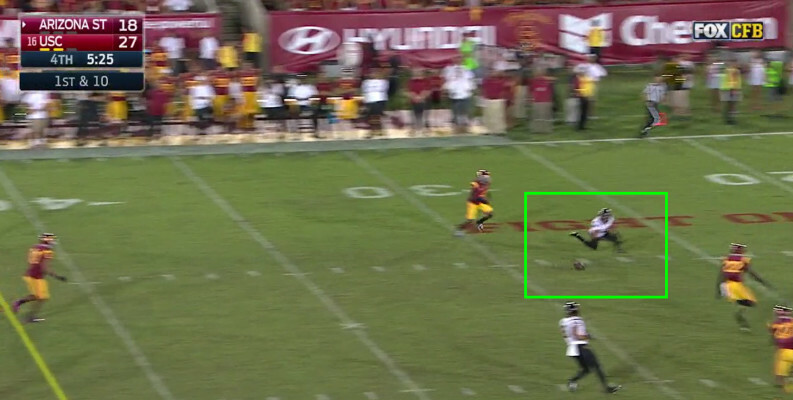 This isn’t Bercovici’s first read though. The rest of the receivers are going to be running go routes, maybe with some diagonal on them to create more space. The defense is playing a ‘quarters’ zone coverage and the receivers are going to need to be on the same page as the quarterback to find the holes. A good pass, or both players on the same page, means touchdown for the Sun Devils. The defense, obviously threatened by Foster, shades towards him. The receiver lines up on the inside of the trips, leaving a hole for the number two receiver to find deep downfield. Bercovici sees this as well and if the receiver and Bercovici are on the same page, this play will go for a huge gain, if not a touchdown. The receivers find the hole in the zone and if the QB sees the same hole, it spells bad news for the defense. The Sun Devils’ defense has been a very pleasant surprise for them this year, leading the Pac-12 in nearly every rush defense category. In yards per rush, the Devils are first in the conference and 13th in the nation at 3.9. The defense also only gives up 8.5 rushing yards per drive and again are first in the conference and ninth in the nation. There are many more telling statistics about the Sun Devils, and indeed every team, at fbsdrivestats.com. The Ducks are clearly a run first team, with 34.9 rushing attempts every 10 drives (12th in the nation), and who wouldn’t be with Royce Freeman in your backfield? This game is going to be won in the trenches. That being said, let’s take a look at how the Sun Devils may try to stop the option. The Sun Devils run defense is phenomenal. 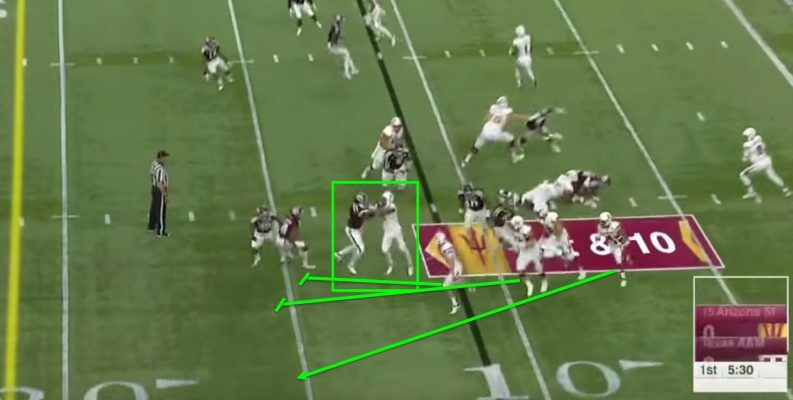 As you can see in the screenshot above, the Sun Devils are lined up in a 3-4 with the right outside linebacker showing pass rush, despite the Aggies four receiver set. The Aggies are lined up in the pistol. The right defensive end takes up two blocks, freeing up a linebacker. At the snap, the left defensive end finds he is the read man, so he is going to get the quarterback and force him to hand it off to the running back. The nose tackle is going to rush straight ahead, trying to push the lineman blocking him as far back as he can. The right end is the key. He is going to eat up two blocks, leaving at least one linebacker free to make a play. The defense swarms the running back for a gain of two yards. The ball is handed off to the running back and the linebacker jumps to fill the hole and the rest of the front seven swarms the ball and pummels the running back for a meager gain of two. This game is going to be won in the trenches, as I said, but Vernon Adams could change this if he comes out ready to play and 100% healthy. If the Ducks can throw the ball well and slow down the Sun Devils passing attack just enough, they pull out a huge win on Thursday night, on national television, in a very hostile Tempe environment, versus a very good Arizona State team. The Ducks have to win this game to stay in the race for the Pac-12 North. The Ducks know this, so I think they’re going to come out firing; Ducks win, 34-27.